Developers and administrators alike will refer to Apache Tomcat logs from time for diagnostic and performance data. Tomcat uses a customized implementation of java.util.logging called JULI (Java Utility Logging Implementation). JULI is very similar to standard Java SE logging, even supporting the same configuration file, logging.properties. 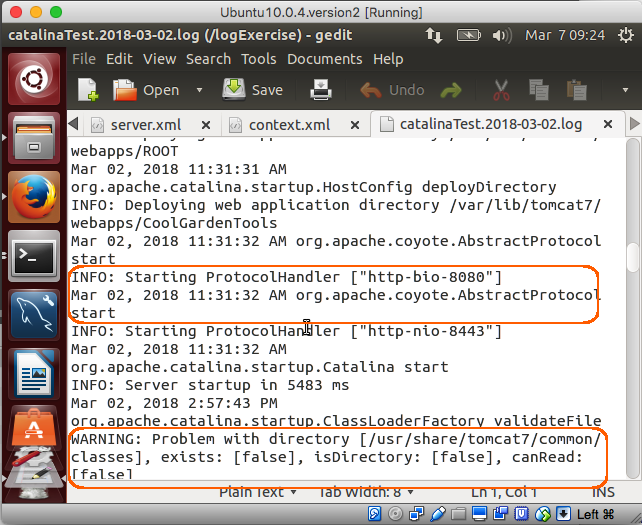 In this topic, we'll explore a way to route the Catalina logs to a specific destination and then check out the log contents. Directly under the root of your file system create a folder named logExercise. In addition, verify that the log level is INFO as shown above. If the log level happens to be different, change it to INFO. where "tomcat7" should be changed to the user under which Tomcat is running. Note that the log line output contains the date, time, log level and a message. Because of the log level of INFO, messages with a level of informational or more severe levels (e.g., WARNING) are displayed.The screen shot above shows a warning message displayed among the informational messages.